The value of Fundamentals- take our student’s word for it! Hey Ryan, wanted to send you a quick message. This past weekend I was in an IK on the Trinity River in California. I got thrown out in one of the larger rapids. Lost my kayak but managed to hang onto my paddle. I found myself heading towards a strainer and a boulder garden, but I suddenly remembered the exercise you had us do in guide training where we used our paddle. I used it to paddle into a better line through the rapid and around the obstacles and to get rescued. Just wanted to reinforce what you already know–these skills are very necessary and you never know when they will come into play! Hope your trainings are going well! He took a fundamental skill we taught for only a few minutes at the start of our flat water sea kayaking program, and applied it to a different craft, IK (Inflatable Kayak) in a much different environment- a river. The fundamentals are not only essential but transferable. 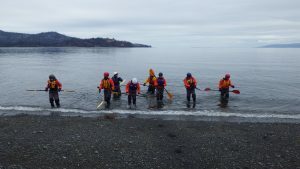 One of the things we stress during our training sessions is that we are training you for your paddling future, not simply for your next sea kayaking adventure, or to pass an assessment or to complete the course for your employer. Almost everyone we meet goes on to do great adventures in many different paddling disciplines. The fundamentals- especially the way we introduce and coach/instruct/teach people through these skills- really are the foundation skills applicable to all paddling disciplines and crucial to setting yourself up for future success no matter what your ambitions are. This entry was posted in Instruction on December 7, 2016 by ryan. 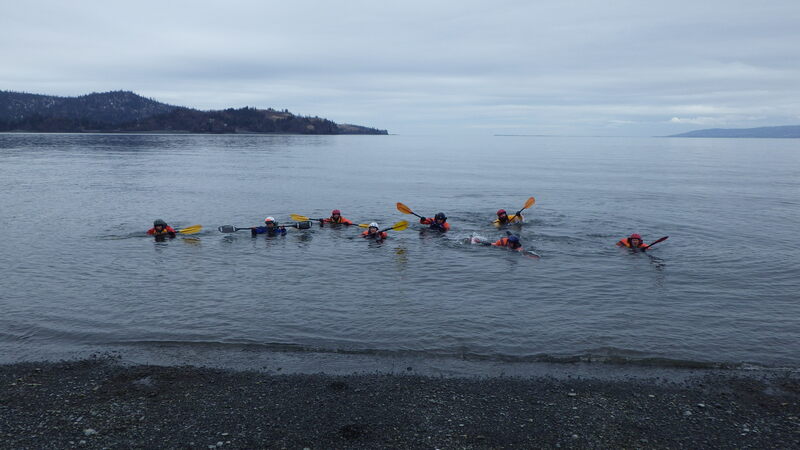 I feel that there is a common misperception about what exactly constitutes sea kayaking. 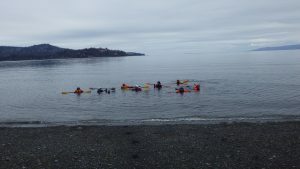 Sea kayaking is much more than paddling in a straight line from point A to point B on flat water! Not that there is anything wrong with that. It’s an incredible experience to glide through the water, your bow splitting the perfectly mirrored reflection of your surroundings. 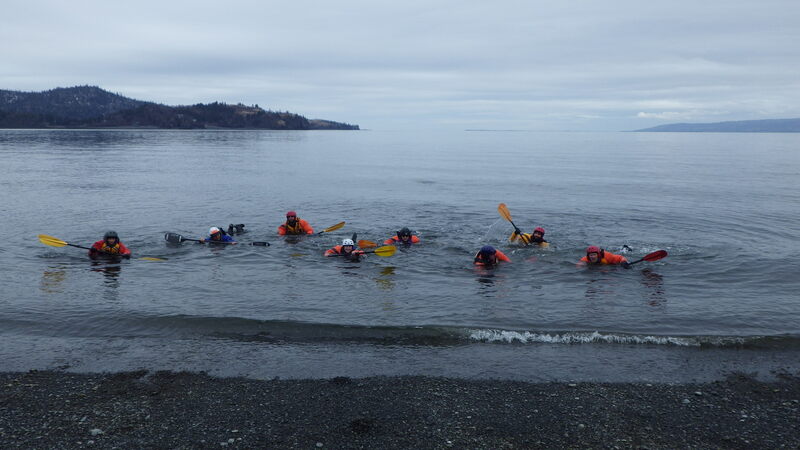 But this is merely one aspect of what is possible in the realm of sea kayaking. 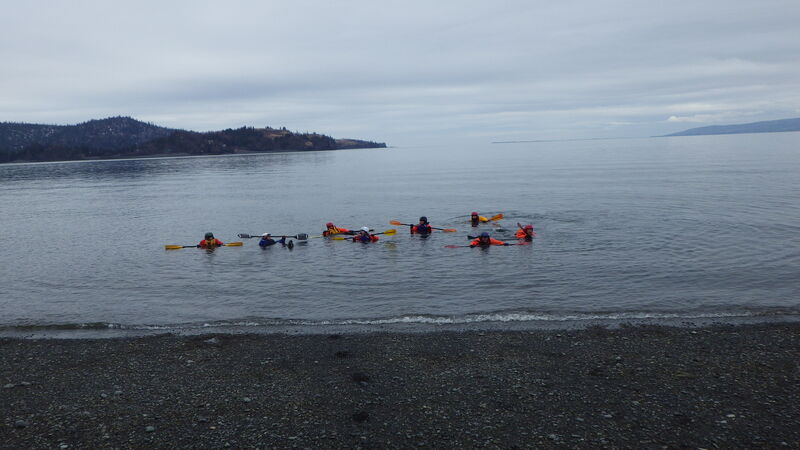 To look at sea kayaking in this one dimensional way is like skiing on green runs forever, or mountain biking on a flat dirt road. Both are great, but if you have the type of personality that likes a little more excitement, that ventures off into the trees, and seeks out blue or black runs, or rocky single track, then likely you will not stay on the greens or flat dirt roads for long. 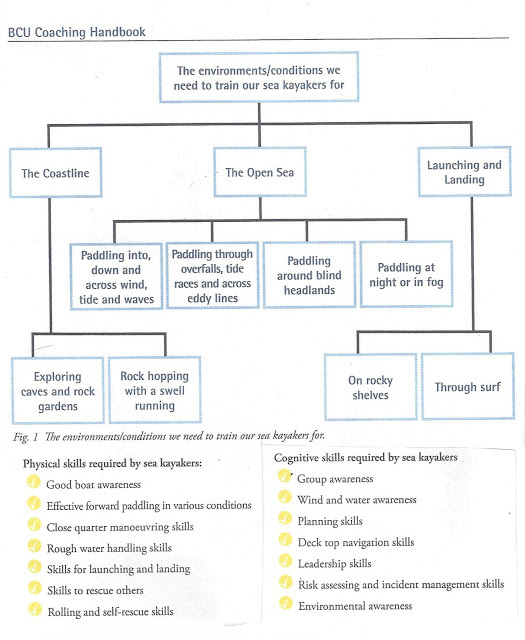 Below is a schematic from page 252 of the BCU Coaching Handbook* that is a wonderful visual summary of the “environment/conditions” one can explore and seek out, and the exciting obstacles associated with them. People seek instruction/coaching/teachers for skiing, avalanche safety, organized sports, learning to play instruments….an on and on. I grew up downhill skiing. I rented gear at the resort as part of a package which included a day lesson and lift ticket. This was my introduction to downhill skiing. I know this is not a universal experience, but generally people start out skiing at a resort on established patrolled trails with all kinds of resources at their finger tips, the trails are marked, avalanche mitigation is taken care of, and shelter is available throughout the mountain. In sea kayaking there is no “resort”, no patrollers, no signs that tell you what kind of a trail you are about to endure, no shelter. Now let’s take it a step farther. Let’s head into the backcountry! When you head into the backcountry there are no trail signs, no patrollers, no shelter, and nothing explaining the risks you will encounter. You are responsible for yourself and your group. For these reasons, I liken sea kayaking to skiing/snow boarding in the backcountry: As an independent paddler or group of paddlers, you are responsible for interpreting weather forecasts and sea states. You are also responsible for medical events/emergencies. You are responsible for knowing how to communicate with the outside world when necessary and a cellphone, though a great resource, is not always the answer. If you fall over/ wipe out while skiing, it might seem like a process to get back up, but most people are able to figure it out. 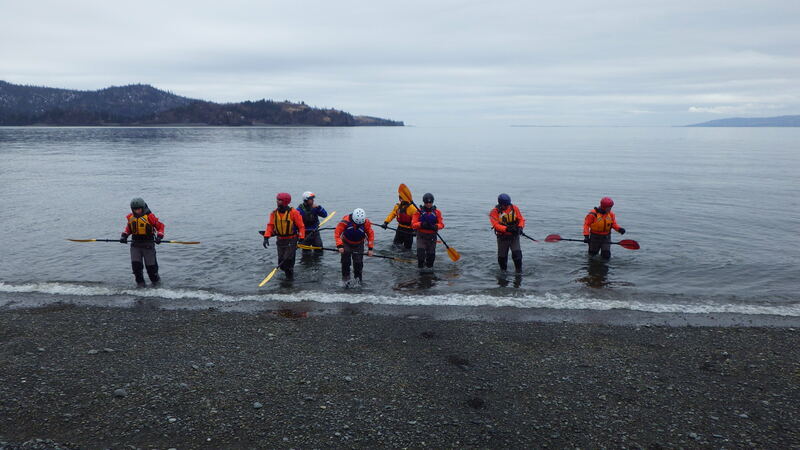 In sea kayaking if you loose your balance, fall over/wipe out -“capsize”- you are soaking wet in cold water- almost all water in Alaska is considered “cold water”, and may or may not be able to figure out how to get back onto your craft. Notice I say “onto your craft” as opposed to into your craft! There is a great distinction between the two. 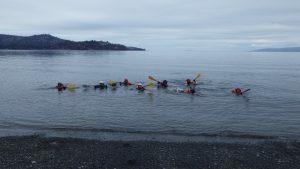 Just because you are able to get yourself back onto the kayak- which is not as easy as it sounds, does not equate to getting yourself back into the kayak. The latter is an entirely different skill all together. One might argue that the likelihood of “falling” over is much greater in skiing than in sea kayaking. True, but it is a matter of balance regardless, which opens up the possibility of capsizing. Oh wait, do you know how to get out of the kayak when the “unlikely event” of capsizing does occur? Remember, it’s cold water and your upside-down and potentially panicking. In skiing you have to learn to steer and control yourself. True. The rudder has done a lot to aid in this aspect, but what if this wonderful tool fails. Yes I’ve had them fail. Failure does not have to mean the system breaking. 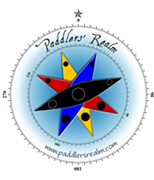 It can be as simple as your foot slipping off of the pedal/footpeg that controls the rudder. Now you have to retrieve it. Again often easier said than done. I’ve guided many many trips throughout the years and have helped innumerable people retrieve their pedals/footpegs. Now, throw in a slight breeze, maybe some boat wake or how about a calving glacier? Rudders are great but I feel that they offer a false sense of security. Not only that, but when they fail in whatever capacity they do, it is usually not an immediate fix. So far all of these events have occurred on flatwater paddle! But enough of that. 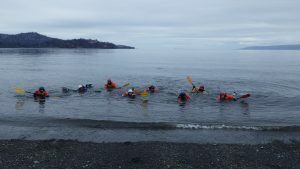 My goal here is not to motivate sea kayakers out of fear, but instead to expose the vast diversity of sea kayaking, to explain how just like mt. biking and skiing, the sea kayak and paddle are extensions of yourself. As you gain skill and confidence you can enter into incredibly dynamic natural environments- natural playgrounds- that you might not have ever thought possible: rock gardens- riding swells to maneuver around and over rock outcroppings, gliding through gaps in the rocks. Surfing- embracing the surf and surf zones, navigating surf beaches for safe launching and landing. Playing in current: tide races and over falls. Exploration-understanding wind, waves and current, navigation and chart reading for solid trip planning; to embrace that which you might otherwise avoid. My ultimate goal is to offer insight into this fantastic sport/discipline, to promote safety, and to let you know how I and other coaches/instructors can help you achieve whatever your paddling goals may be. There is an abundance of talented coaches worldwide. My motivation is not entrapping flies in the web, but promoting safety and education in this wonderful discipline and giving people a solid foundation from which to build upon. * BCU Coaching Handbook Published by Pesda Press 2006. This entry was posted in Instruction on December 31, 2015 by Drew Trousdell.